For several years Howard Chen has worked with Guido de Groot, the famous Dutch designer to create new yachts, which have all the qualities of a Selene classic ocean yacht but with softer lines and a different interior decoration that attract demanding owners. 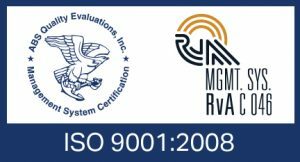 James Fwu of JFNA, a renown naval architect of Taiwan joined this international team for the hull lines, hydrostatic data, structural design, stability calculations, dynamics performance and final “EU Type Examination Certificate” with RINA. 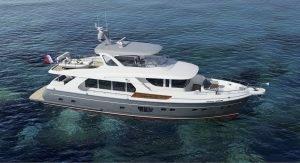 This new Selene 72 Ocean Explorer design is going to appeal to existing Selene enthusiasts and takes the simple and proven concept of a fuel efficient and seaworthy long-range yacht vessel to a new level of luxury that is intended to compete directly with the finest European shipyards with all of the advantages and flexibility of FRP. Selene shipyard directly sources the best products and has some of the best shipwrights in the industry. Selene people have years of experience that have made them experts in the design and building of beautiful and seaworthy yachts, down to every detail. With a LOA of 75’-9”, a displacement of 158,688 Lbs ( 72 Tons ) and equipped with two Cummins QSL9 405 BHP engines (a single engine version is also available), the Selene 72 Ocean Explorer carries more than 3,000 USG ( 11 355 Liters ) of fuel for long range voyages at a cruising speed of 9 knots, with a top speed of 11.5 knots. 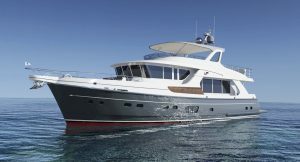 What is catching eyes is the elegant combination of modern styling and the line of a reassuring ocean going vessel. 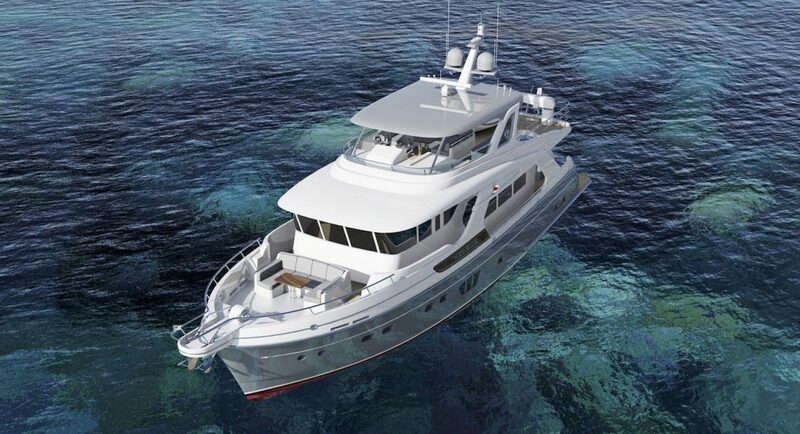 It shows a number of the Selene family traits with her powerful raised pilothouse, Portuguese bridge, wide upper deck, and walk-around side-decks which provide safety and convenience for passengers of all ages ( wide-body or semi-wide-body is optional.) 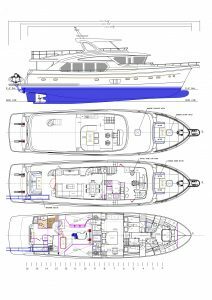 But a new approach is also visible in the addition of the large side windows in the hull and the curvy and sleek lines of the flying bridge. This exterior elegance extends to the beautiful light-filled interior. The climate-controlled salon offers high-end comfort with a surrounding view of nature while cruising or at anchor. 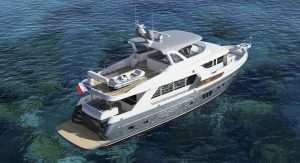 The lower deck of the Selene 72 Ocean Explorer has three guest cabins, a luxurious full-beam owner’s cabin and a crew’s quarters with two cabins and private head which is connected to a very large swimming platform, which can be equipped with a hydraulic Tenderlift. Beautiful joinery, fit and finish combined with first-class equipment and amenities deliver unique prestige to the owner. The spacious interior promotes entertaining with comfort-minded cabins where the passengers can enjoy the voyage.